Most sit-stand desktop workstations in the market are bulky and clunky in their appearance. Not only do these “dinosaurs” take up an enormous amount of desktop space, they hamper the aesthetics and interior design of any home or office work environment. 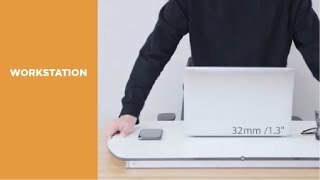 LUMI’s DWS07-01 is the next evolutionary step in sit-stand desktop workstations. So thin and sleek it virtually melts into the desk it's sitting on. With a contemporary minimalist design and simple operation, it comes out of the box ready to use without any assembly. The high-quality desktop uses a compact board that is thin, lightweight, scratch-resistant and provides protection against spilled liquid. The durable aluminum frame provides a solid foundation for your work and the simple lift and lower mechanism is smooth to quickly adjust to your desired height. Best of all, the DWS07-01 helps you become more active and healthy while improving your productivity.